Frazer-Nash Senior Consultant, Dr Thomas Coe, in collaboration with the Naval Design Partnership, is set to talk about the future of shock mitigation at this year's NEXT GENERATION Workshops. 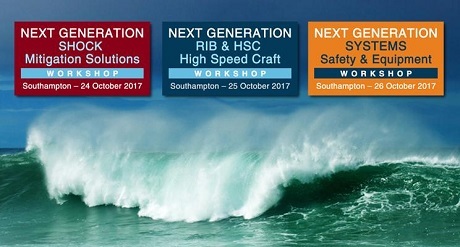 To be held at the Grand Harbour conference venue, overlooking the port of Southampton, from 24-26 October, the workshops address aspects of operational safety for marine vessels, along with the safety and welfare of their crew and passengers. The high level group of presenters will bring a wide range of experience and expertise from sectors including workboats, ports, security, search and rescue, and defence. Dr Coe's paper, 'The Future of Shock Mitigation Testing - Getting from Anecdote to Evidence' will be presented during the Shock Mitigation Solutions Workshop on 24 October. The workshops will examine emerging technology compared to traditional methods. Event organiser and Workshop Lead, John Haynes said, "Maritime industry is steeped in tradition with a long history of changing slowly - but not anymore! The future is arriving faster than expected, but how do we identify genuine improvements compared to novel ideas that simply do not belong at sea. Our approach is to bring together a group of experts to consider what really works on a dark and stormy night." "In recent years fewer people are expected to do more work and time is becoming scarce for everyone in the marine industry. Our focused one day Workshops are designed to deliver fast moving and highly relevant sessions. I have personally asked a number of organisations what are their most burning issues. Their suggestions, along with feedback from recent NEXT GEN Workshops, have been used to develop the October programme." For more information and how to attend, click here.